This is what happens when you take 1950s valve-driven technology - courtesy of the amazing Jennings Univox valve synthesiser – and pump it with so many tachyons that it warps through its own wormhole into an alternate future. Well, not really. But that’s kind of what we were thinking when we started Jennings Mk 2: what would a massive analogue polysynth – the kind Roland were building in the 80s, say – sound like if the only technology available was 1950s valves? Jennings Mk 2 reinvents our original Jennings Univox. With the original we aimed at a painstaking recreation of the machine the Beatles used in The Cavern down to the smallest details, but the Mk 2 version abandons historical accuracy and instead takes the concept of a valve synth far further. Instead of one detuneable oscillator, we give you three (and a sub); instead of one set of waveshaping tabs, you get two, which can be operated in parallel. 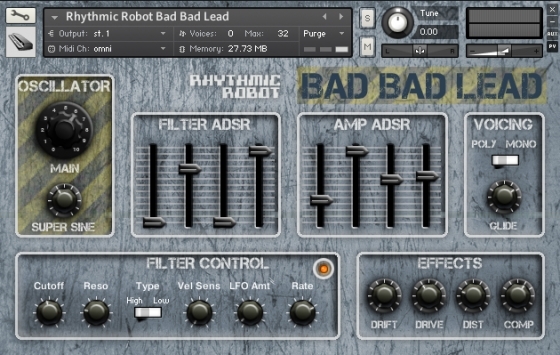 The first two oscillators give you that unique and evocative 50s valve tone, while the third broadens your sonic palette hugely by roping in classic analogue waveforms including sine and noise waves. These instantly expand the typical compressed, raucous tone of the Jennings oscillators with everything from thick sawtooths to smooth sines and bright triangles. A quick twist of the Volts knob can roughen these up hugely. On the Osc 3 Effects pane you can add chorus, phasing, echo and rotary speaker to the third oscillator while leaving the blended valve tones shining through; or you can use the modelled amp cab to get a more Jenningsy tone into the third oscillator, blending it and creating a more vintage tonality. Further fun comes courtesy of the Jennings valve-based sub-oscillator, which tracks the envelope and pitch of Osc 1but an octave lower. It cheerfully bypasses Osc 1’s filters, lending its rude-boy snarl to any patch you want. (If you tune Osc 1 up an octave, this brings the sub-oscillator up to normal pitch but lets Osc 1 behave as a nice high-pitched shimmer. Neat!) And finally there’s the classic Jennings “Perc” setting, which can be dialled into add some key-click to key or bass patches. 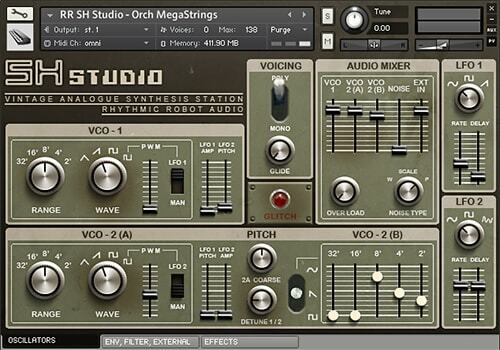 Four oscillators plus key-click… if you want rich, complex, mobile waveforms, this thing delivers. We went a bit mad with the filters, too. A typical big polysynth might, if you’re lucky, give you two filters to play with; we’ve gone with four. One switchable high / low pass for each individual oscillator, to sculpt the basic waves; and one Global filter switchable again between high and low pass, but also between 2 and 4 pole, with its own LFO and ADSR envelope. This is where you can create sweeps and movement. Bandpass effects can of course be dialled up easily by having the Oscillator filters in one mode and the Global filter in the other, and you can get some great burbles and fizzes out of this arrangement. There are LFOs scattered all over the synth, perfect for creating movement, and they can all be cranked up into the audio range for serious weirdness if you want to go that far. The Osc 1 and 2 LFOs and the Global Filter LFO have switchable shapes, so you can get special effects and pulses going using the ramp or square; or randomised effects with the smoothed sample-and-hold. Osc 3’s LFOs are sine-based, but there are two of them, controlling pitch and amplitude for separate tremolo and vibrato. Old technology usually comes warts-and-all, with weird little idiosyncrasies and quirks that make it just a little unpredictable (in a good way). Jennings Mk 2 embraces this, and you’ll find that the Osc 3 Effects Section also affects the Sub-Oscillator and Key-Click components, while if you want to go for all-out unpredictability, there is of course our world-famous Glitch control which short-circuits the Jennings and yields up randomised, unique patch settings every time you click it. These are “musically” randomised, so you don’t get atonal mush every time – the Glitch control is internally biased towards musically-useful results. Try it and see, and if you don’t like the sound, try it again! The original Jennings brought the forgotten sound of a lost synth era back to light. Jennings Mk 2 takes that sound and lets it off the leash for sonic exploration far in advance of the original hardware. You can use it to recreate classic synth patches which will come out with a totally different, valve-based flavour; to cook up strange, vintage tonalities that feel both unknown and familiar at the same time; and to make new, unique, warped instruments whose sonic palette references a bygone age. This is a strange, magical machine.